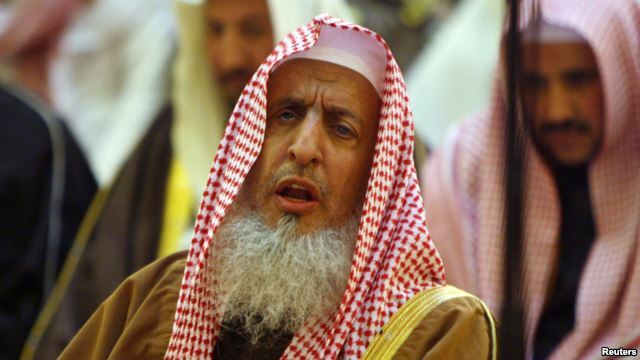 JNN 21 Aug 2014 Riyadh : Saudi Grand Mufti Sheikh Abdul Aziz al-Sheikh in a Surprise Move on Tuesday allegedly blasted Al-Qaeda and the so-called Islamic State of Iraq and the Levant (ISIL) as “enemy number one” of Islam, in a statement issued in Riyadh. “The ideas of extremism, radicalism and terrorism … have nothing to do with Islam and (their proponents) are the enemy number one of Islam,” . He cited Terrorists from the ISIL, which has declared a “caliphate” straddling parts of Iraq and Syria, and the global Al-Qaeda terror network. This is while Iraqi government has earlier blamed Saudi Arabia again for a rise in bloodshed and terrorist attacks in the country. The Iraqi cabinet said in a statement that Riyadh is supporting and financing the Takfiri militants of the ISIL. It added that the Arab kingdom must be held responsible for the crimes committed at the hands of the insurgents. “We hold it (Saudi Arabia) responsible for what these groups are receiving in terms of financial and moral support,” the statement added. However, Riyadh rejected Baghdad’s accusations and blamed ex-prime minister for what it called “pursuing sectarian policies”. According to the Iraqi government, Saudi Arabia’s comments are a further indication of Saudis’ siding with the terrorists. Meanwhile, Iraqi government has informed UN Secretary General Ban Ki-moon that Riyadh must be held accountable for the recent wave of terrorist attacks having claimed thousands of lives in Iraq as well as Syria. On June 10, the ISIL militants took control of Mosul. Hundreds of civilians were killed and thousands of people have been forced out of their homes since that time. This is while, according to earlier reports, some captured terrorists of ISIL have also revealed that the ISIL and other militant groups in Syria not only are supported by a member of the Saudi royal family but the individual actually heads the ISIL. In several video admissions, the members of the ISIL said the radical group actually is led by Prince Adbul Rahman al-Faisal, the son of the late King Faisal of Saudi Arabia and the brother of the current Saudi Foreign Minister, Prince Saud al-Faisal, the WorldNetDaily reported earlier. This entry was posted in Middle East and tagged Iraq, Iraqi government, ISIL, Islamic State of Iraq, Saudi Arabia, Saudi government, Saudi Government Stance, Saudi Grand Mufti, Sheikh Abdul Aziz al-Sheikh, Syria, Verdict. Bookmark the permalink. hey mufti, why don’t you preach this to your papa abdulla for sending cannibals to kill innocent men women and children in syria & Iraq?Your papa is the financier of all the terrorists in middle east.Remember 9/11 ?What will your next fatwa be, i wonder, not to fart on sundays and viagra to be freely available to people of your age, you can only murder/maim innocent people in a month that has 32 days.Your papa is also responsible for the slaughter of innocent people in pakistan by way of target killings and sectarian differences !